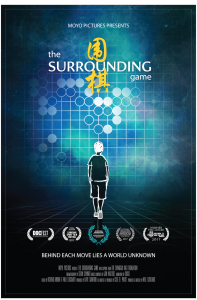 “The Surrounding Game” is coming to a theater near you! The documentary team has just announced a summer lineup of screenings in major cities across the US and Europe. 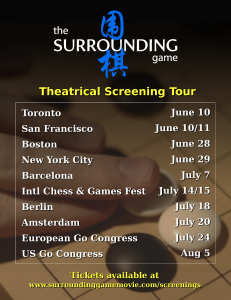 The screening tour includes stops in: Toronto (6/10), San Francisco (6/10-11), Boston (6/28), New York City (6/29), Barcelona (7/07), The International Chess & Games Festival in Pardubice, Czech Republic (7/14), Berlin (7/18), Amsterdam (7/20), the European Go Congress in Oberhof, Germany (7/24), and the US Go Congress in San Diego, CA (8/05). If you don’t see your city on the list, don’t worry – you can sign up to host a screening in your community. The film is now available to screen in theaters and community spaces. “We’re offering two options for volunteers to host a screening on their own” explains director/producer Will Lockhart. “ If you have a venue in mind, you can order a community screening pack, which will provide all the tools to host a successful event. Or, if you’re keen on getting the film to play in a local theater, you can sign up with our partners at Tugg. If you gets enough RSVPs, they’ll arrange to put the film in a local theater.” The team reports that several community screenings hosted by local go groups are already in the works. If your club wants to host a screening of the film, click here or contact the team directly at screenings@surroundinggamemovie.com. The game was extraordinarily complex, with seven separate groups on the le ft and lower sides, all of them interrelated and none of them settled. 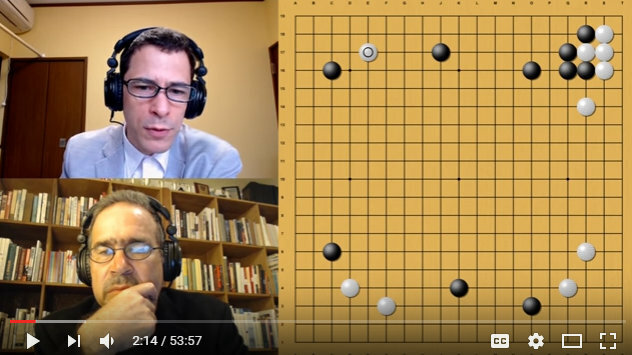 This type of complex interaction, impossible to calculate fully and demanding the most of each player’s value judgment and intuition, brought both Ke Jie and AlphaGo into their element. With many groups hanging in the balance, both sides continued raising the stakes. 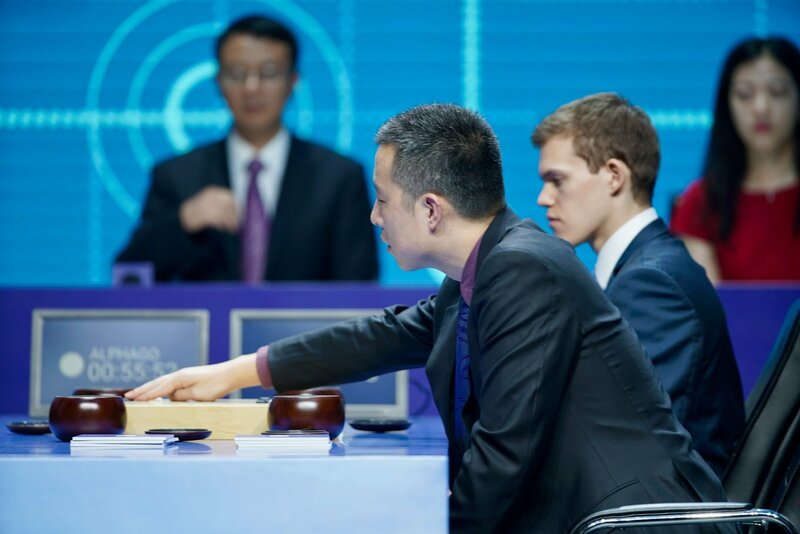 Ke Jie played daringly, creating the possibility of sacrificing the ko and two of his groups to take AlphaGo’s two groups in the upper left on an even larger scale. 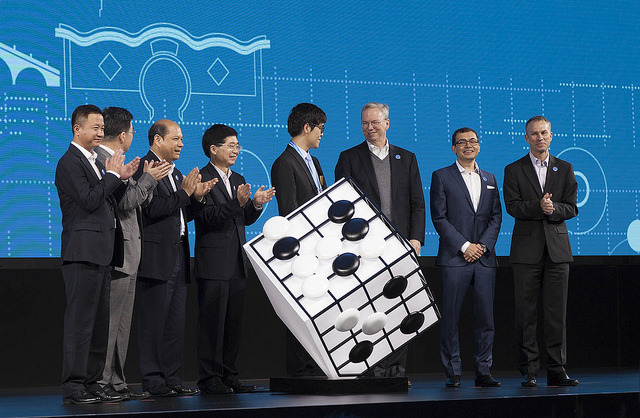 However, AlphaGo chose to settle the ko and the game by connecting at move 137, conceding enormous gains to White on the lower left to secure even greater profits in the lower right. As Ke Jie, playing white, could not control the whole upper left, AlphaGo’s territorial advantage proved decisive. DeepMind is streaming the matches live, posting match updates and expert commentaries every day on this page and on their Twitter account, @DeepMindAI. For more details, you can visit the official event page here. American Go Association chapters continue to play watch parties (they’re eligible for $100 in non-alcohol expenses like pizza; click here for details); email details to journal@usgo.org and we’ll post an updated report. 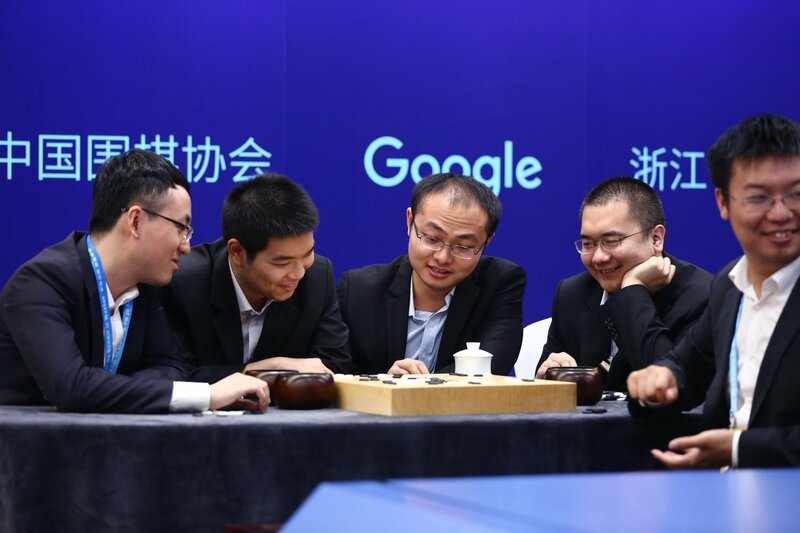 The version of AlphaGo that defeated Ke Jie 9p in the first round of the three game challenge match yesterday was trained entirely on the self- play games of previous versions of AlphaGo, a Google DeepMind engineer told an audience in China. 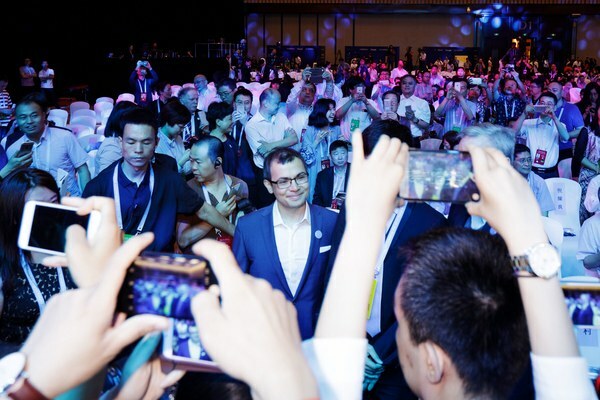 David Silver (at right), lead researcher on the AlphaGo project, told the Future of AI Forum in Wuzhen that because AlphaGo had become so strong, its own games constituted the best available data to use. 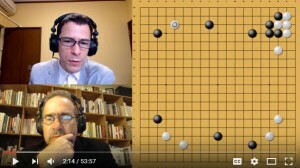 The version of AlphaGo that beat Fan Hui 2p in 2015 (AlphaGo Fan) and the one that defeated Lee Sedol 9p last year in Seoul (AlphaGo Lee) each included a “value network,” designed to evaluate a position and give the probability of winning, and a “policy network,” designed to suggest the best next move, that were trained using hundreds of thousands of skilled human games. The most recent version, AlphaGo Master, trained both networks on a database of its self-play games generated by its predecessors. This was not the only new information Silver revealed about system. 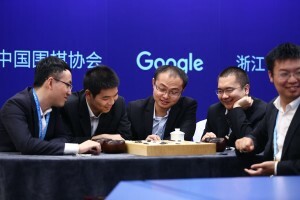 The version playing Ke Jie is so much more efficient that it uses one tenth the quantity of computation that Alphago Lee used, and runs on a single machine on Google’s cloud, powered by one tensor processing unit (TPU). AlphaGo Lee would probe 50 moves deep and study 100,000 moves per second. While that sounds like a lot, by comparison, the tree search powering the Deep Blue chess system that defeated Gary Kasparov in the 1990s looked at 100 million moves per second. “AlphaGo is actually thinking much more smartly than Deep Blue,” Silver said. In addition, Silver revealed that DeepMind had measured the handicap needed between different versions of the software. AlphaGo Fan could give four stones to the previous best software, such as Zen or CrazyStone, which had reached 6d in strength. AlphaGo Lee, in turn, could give AlphaGo Fan three stones, and AlphaGo Master, which at the new year achieved a 60-game undefeated streak against top pros before coming to this challenge, is three stones stronger than AlphaGo Lee. Silver delivered this with the caveat that these handicap stones are not necessarily directly convertible to human handicaps. Professional players suggested that this may be due to AlphaGo’s tendency to play slowly when ahead — i.e., an AlphaGo receiving a three stone handicap may give its opponent ample opportunities to catch up, just as yesterday’s AlphaGo let Ke Jie get to a 0.5 point margin. 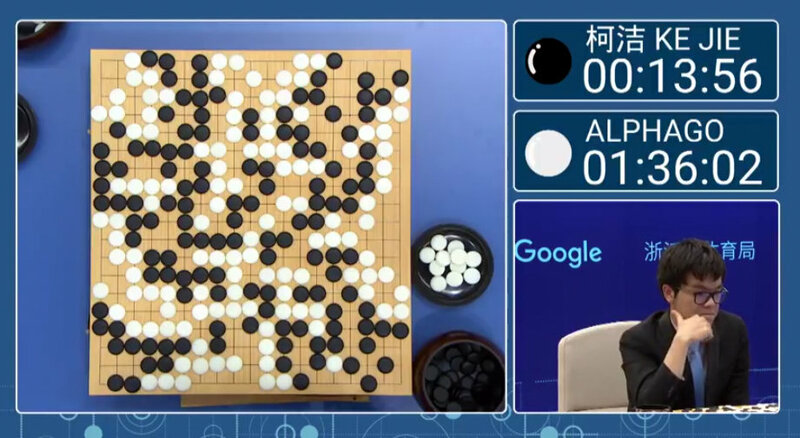 This also reveals that AlphaGo is able to play with a handicap, previously a matter of speculation in the go community. 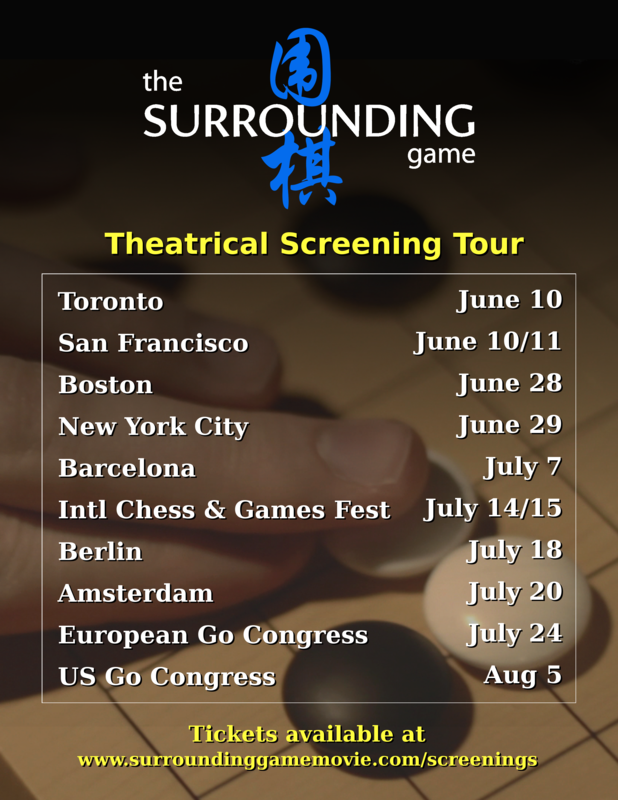 AlphaGo-Ke Jie viewing parties continue this week at the National Go Center in Washington DC (Center opens at 7p Wednesday; match at 10:30pm EDT); the Seattle Go Center will be open late again Wednesday night as well (schedule is on their calendar), and the Triangle Go Group will host an AlphaGo viewing party on Wednesday evening at the EcoLounge at Recyclique, 2811 Hillsborough Rd, in Durham. The Boulder Go Center will host an AlphaGo Viewing Party on May 27 in Denver, CO. Contact Stu Horowitz at stuart590@earthlink.net 720-289-6927 for details. Myungwan Kim will stream live game commentary Thursday night on the AGA’s YouTube channel, starting at 11PM PST. Got party? Email us at journal@usgo,org! Chinese officials perhaps unwittingly demonstrated their conflicted feelings at the victory by software backed by a company from the United States, as they cut off live streams of the contest within the mainland even as the official news media promoted the promise of artificial intelligence. This week’s match is AlphaGo’s first public appearance with its new architecture, which allows the machine to learn the game almost entirely from play against itself, relying less on data generated by humans. In theory, this means DeepMind’s technology can more easily learn any task. Underpinned by machine learning techniques that are already reinventing everything from internet services to healthcare to robotics, AlphaGo is a proxy for the future of artificial intelligence. 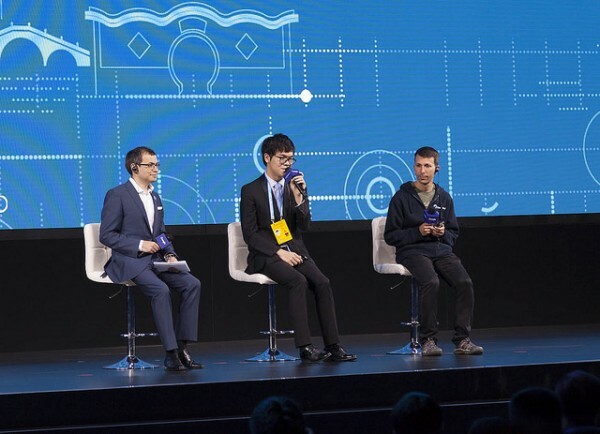 This was underlined as the first game began and (DeepMind CEO Demis) Hassabis (in photo) revealed that AlphaGo’s new architecture was better suited to tasks outside the world of games. Among other things, he said, the system could help accelerate the progress of scientific research and significantly improve the efficiency of national power grids. 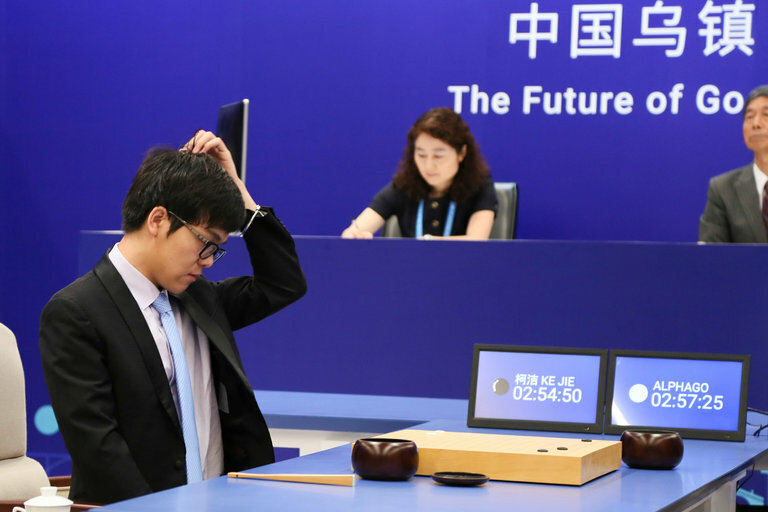 In an exciting game played out to the last dame, the latest version of AlphaGo defeated Ke Jie 9P by half a point on Tuesday in the first round of a 3-game match in Wuzhen, China, part of the Future of Go Summit. The Summit features several formats, including pair go, team go, and a 1:1 match with the world’s number one player Ke Jie. 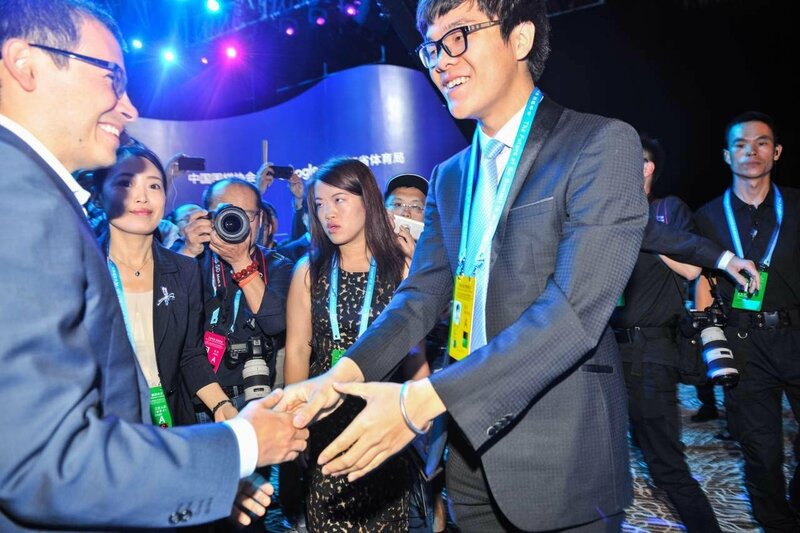 “Ke Jie fought bravely and some wonderful moves were played,” said Deepmind’s Demis Hassabis. 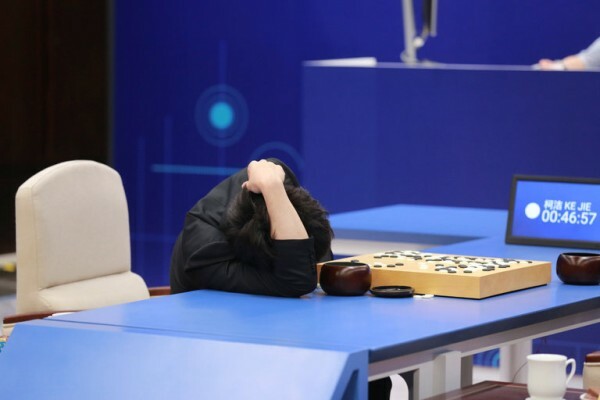 “Interesting game, but it didn’t seem like Ke Jie ever had a real chance,” tweeted SmartGo programmer Anders Kierulf, an assessment that seemed shared by commentator Michael Redmond 9P, whose analysis from fairly early in the game had AlphaGo leading. However, Ke Jie was clearly prepared with a strategy — his second move was on a 3-3 point — and the complex game kept go fans riveted to their screens around the world and, in the US, into the wee hours of Tuesday morning as the endgame played out, providing plenty of fodder for the English language commentary team, which, in addition to Redmond, included Hajin Lee 4P, Stephanie Yin 1p and Andrew Jackson 4d. DeepMind will be streaming the matches live, posting match updates and expert commentaries every day on this page and on their Twitter account, @DeepMindAI. For more details, you can visit the official event page here. American Go Association chapters continue to play watch parties (they’re eligible for $100 in non-alcohol expenses like pizza; click here for details); email details to journal@usgo.org and we’ll post an updated report. This post has been updated: Andrew Jackson is 4d, not 5d as originally reported. 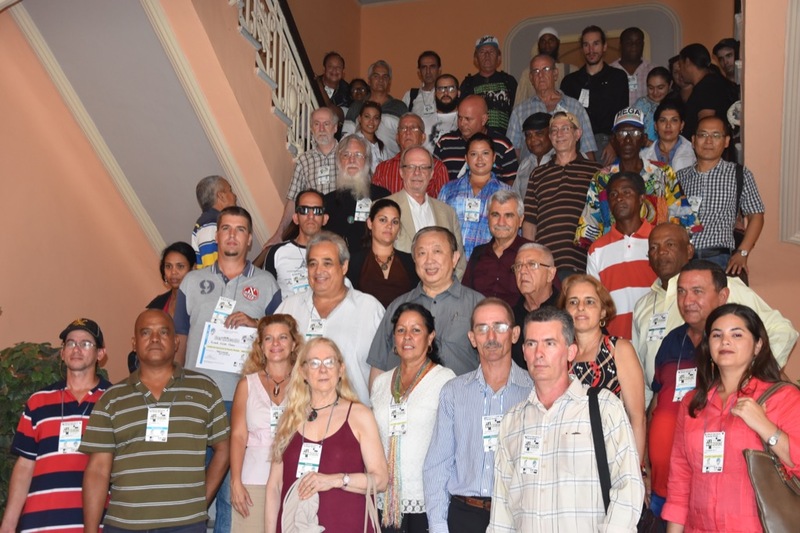 A fabulous feast of “food for thought,” the International Conference on Mind Sports in Camaguey, Cuba came to a successful close on May 5 after affording some 70 participants a chance to get to know enthusiasts of other sports. Mornings were devoted to lectures and presentations, with various events , friendship matches and exhibitions in the afternoon. In an indicator of the level of interest Cubans have in mind sports, the first day of the conference was televised. Here’s a rundown of some of the interesting presentations. THE FUTURE OF MIND SPORTS IN CUBA: Dr. Lazaro Bueno said that notables from Simon Bolivar to Che Guevara, Fidel Castro and Hugo Chavez have all spoken of the importance of mental competition and chess in particular. Dr. Bueno also unveiled plans for a large Mind Sports Complex to be built soon in Camaguey. TEACHING CHESS IN PRESCHOOL: Columbus introduced chess to Cuba in 1492, and the subsequent history of chess in Cuba is filled with distinction. 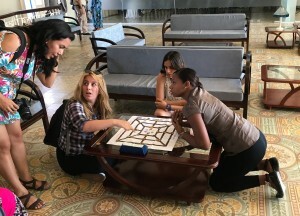 The Cuban school system has included chess in its curriculum since 1989, and at present chess is taught in more than 9000 primary schools and over 1000 high schools. Luis Enrique Perez Pena said chess is now being introduced to preschool children. With Cuban children starting at such a young age, the world may see another Capablanca before long. PITARRA – INDIGENOUS OR UBIQUITOUS? Maria Cristina Quintanar Miranda from the Universidad Queretaro in Mexico gave an intriguing presentation, describing the evolution of Pitarra (right). Played only by indigenous Mexican tribes, she theorized that it had developed as an ancient folk tradition. However, it turns out that “Pitarra” is identical to Nine Men’s Morris, a game dating back to the Roman Empire and still played in Europe. 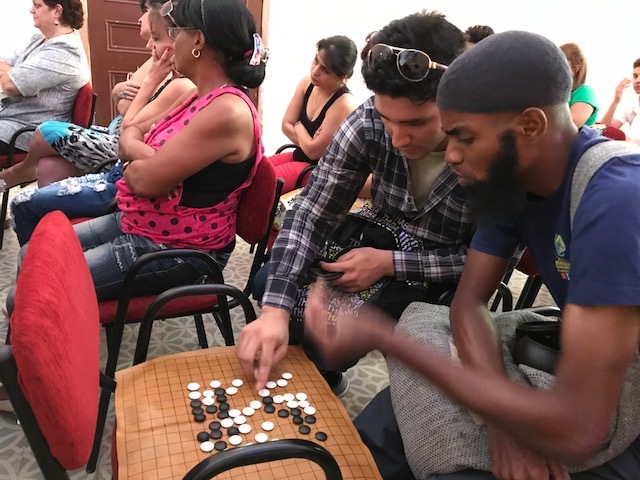 Not only that, another attendee recognized the game from his childhood in Taiwan as “The Watermelon Game,” and it is played in Cuba as “Tres,” named after the central principle of lining up three pips in a row. Ms. Quintanar came to the conference with an interesting finding and left with an even more interesting question. SPANISH SCRABBLE: A Spanish version of Scrabble is a big seller in Latin America, and Mexico in particular, where it is so widely played that some Mexicans call it “Lexico.” Javier Guerrero, the head of the International Spanish Scrabble Federation (FISE), said that FISE aspires to IMSA membership, but since IMSA does not admit sports that involve any amount of luck Scrabble advocates have proposed a form of “duplicate Scrabble” in which each player would play against a computer programmed to assure randomization of moves. However, Scrabble faces an even bigger hurdle — IMSA does not admit mind sports that are copyrighted or trademarked. UNDERSTANDING ASIAN THINKING THROUGH GO: Fernando Aguilar of Argentina is one of the strongest Latino go players and certainly among the best known, having scored upset victories against two Japanese 9Ps in the 2002 Toyota Denso Cup and having played in many international tournaments. Aguilar was not able to attend the conference, but submitted a paper entitled “Go As A Way to Understand Oriental Thinking” in which he identified five sets of contrasting concepts that are spelled out in detail in Sun Tzu’s classic “The Art of War,” noting that their meaning can be more deeply understood through the study of go. The strong player maintains a balance between Attack and Defense; Efficiency and Concentration of Forces; Transparency vs. Deception; Emptiness and Solidity; and “Chi” (potential) vs. “Li” (material gain). AlphaGo watch parties planned across U.S. The National Go Center’s watch party starts at 10:30p Monday night and runs until the match ends; pizza will be provided. The Center will be open for play starting at 9p and is located at 4652 Wisconsin Ave NW, Washington, District of Columbia 20016. “We’ll also be open for the remaining events,” reports Nate Eagle, including Tuesday starting at 7p and staying open for the Future of Go forum at 9p, Wednesday starting at 7p and staying open for the game starting at 10:30p, Thursday starting at 6p and staying open for the Pair Go / Team Play starting at 8:30p, and Friday starting at 7p and staying open for the final game starting at 10:30p. Click here for the up-to-date listings. 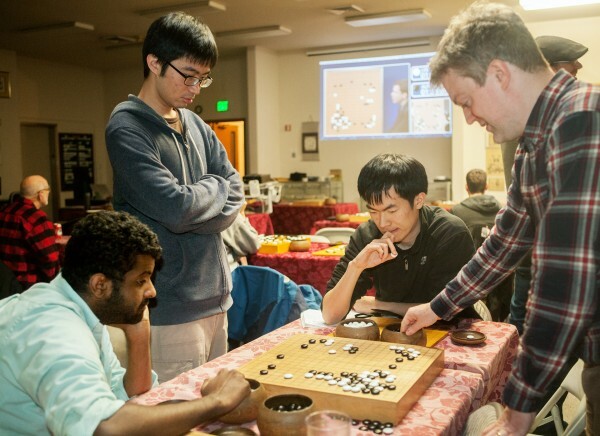 The Seattle Go Center reports that it will be open late to watch all five AlphaGo events. The full Seattle schedule is on their calendar. “We had over 60 players for the first AlphaGo/Lee Sedol game, and there is a lot of interest in this match between Ke Jie and AlphaGo as well”, reports Manager Brian Allen. 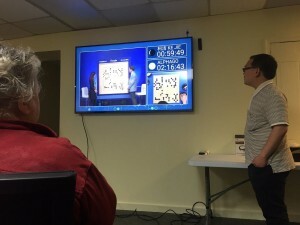 The Neo Millennium Go Club will hold an AlphaGo vs Ke Jie watch party between 3pm and 6pm on May 28th in Andover, Massachusetts (497 South Main Street). Jie Liang, Zhiping You and Ke Lu will be the main commentators. This story has been updated with the Millennium Go Club party.